Utilizing the low price of available AMD processors and high performance of their graphics card this $500 to $600 build is the perfect build for gamers looking to play modern titles in 1080p. Want to get the most out of your gaming PC? Here’s an AMD build I put together that gives you superior 1080p performance in modern games for just around $500 to $600. I’ve taken all the extras out of it in order to give you the maximum amount of performance for your dollar while still giving you some flexibility to overclock when necessary. While the FX 8320 is a few years old, it’s still a fantastic overclocker and an incredible price at just around $130. If you’re willing to overclock it a bit, it should do a fairly good job with avoiding any bottleneck you’ll come across. This is especially true for the graphics card I want to feature for this build, the R9 380. In the $200 space, there’s two main competitors, the GTX 960 and the R9 380. For around $200 the R9 380 is the best performer for the money hands down. Below is a video from MW technology that does a good job of comparing the two. 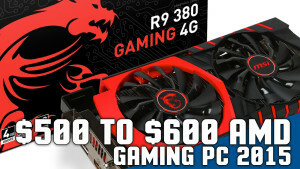 Specifically, the MSI Radeon R9 380 should be on sale for around $200 this month. Here’s a summary of MW Technology’s findings. Summary: As you can see, the R9 380 outperforms the GTX 960 in most scenarios by a fair amount and some above 1080p resolutions by a great amount. Considering both of these graphics cards use a similar amount of power, put out a similar amount of noise, and are within 5 degrees Celcius for temperature, the R9 380 is the one I’d recommend unless you happen to already have a G-Sync monitor. For around $75 this motherboard gives you stability, overclocking potential, and plenty of expansion features. Available for as low as $72 here, the Gigabyte 9 Series GTA-970A-D3P fits our budget and light overclocking requirements. It’s a great board for getting started with a single GPU solution, has USB 3.0 ports, and recognizes up 20 2,000MHz Ram OC. For this build, you don’t need more than 8GB of ram. I suggest something cheap and durable. The Corsair Vengeance 1600MHz 2×4 kit is around $45 and should work well for this build. Available for as low as around $35 this month the Thermaltake Versa H21 is a solid choice for this budget build. It includes two optional 120mm intake fans and comes with one preinstalled 120mm rear exhaust fan. Make sure you find it on sale for $35 as there are more value options in the $50 range. Here’s a summary of the parts used in this build. CPU FX 8320 A few years old but the potential for overclocking and its 8 cores still make it a great value today. Graphics Card MSI R9 380 2GD5T The best performing graphics card in the $200 price range. Capable of running all modern 1080p games. 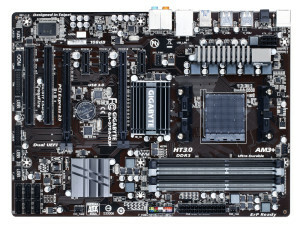 Motherboard Gigabyte GTA-970A-D3P Cheap with plenty of features and durable to boot. With this board you should also be able to do a light overclock. Ram 2x4 Corsair Vengeance 1600MHz Memory 8GB of memory is enough for this build. Power Supply Corsair CX 600 Builder Power Supply I recommend you go with an 80 Plus certified power supply with at least around 600 Watts for this build. Case Thermaltake Versa H21 A good value when its on sale for $35 but other options may be better at its retail price of $50. The FX 8320E is just about the same price as the FX 8320 but has a slightly lower TDP. A solid state drive would be a plus here too. Spend $50 and get a 120GB model to store your OS as well as all of your most important games on.